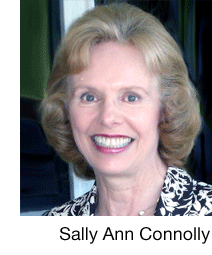 Sally Ann Connolly, mother of four and grandmother of seven, is a former teacher and school counselor. Since 1994, she has served as editor of the Massachusetts School Counselors Association monthly periodical. Connolly’s books include A BOY FROM LAWRENCE: The Collected Writings of Eugene F. Connolly; Never Better: All Things Considered; and Matters on My Mind. Her “lively writing and pithy comments make for easy as well as profitable reading.” (Writer’s Digest) Her website:www.neverbetter.net.